A daily routine is often referred to as the schedule of our day. There is a difference between these two words; routine and schedule. The word routine means a sequence of actions, forming a habit whereas a schedule is something that runs to a time table – dictated to by the clock. As mentioned in Establishing Routines we need to begin this process with small steps, establishing patterns or habits in our family life before we start looking our whole day, before we start looking at the clock. Know what you want to achieve. Be relationship minded – If you have too much planned you become task orientated not relationship focused. Be ready to seize a relationship moment when your child talks to you or needs a hug (you can’t schedule these precious moments). For this to happen you need to see the routine as a tool, not the law. Consider your husbands needs – What are his likes? Dislikes? Can you bless him by working with this? Consider all your children’s needs – If you need to focus on one child at a particular moment, what can the others be doing at this time? Can they do an activity together? Can they be working independently? Consider your needs as well. When are you going to shower? Read the Word? Spend time with your Husband? Phone a friend? These are the bare bones of our day that I base everything else around. Have a starting point for your day. In our family it is 8.00am though before that the children have their personal responsibilities (as do I) that we need to achieve. Because our children are older I allow them the freedom of working through these things their own way. Some like breakfast early, some like to do their chores before breakfast when possible. Some like to sit and meditate for a long while, some pray while they walk the dog. But 8.00am is our point where we all come together. Other families have a breakfast time, or a waking up time as their starting point, as we did when our children were younger. Whatever works for your family there has to be a starting point to your day. This may well have to be your first training step as you work towards establishing habits in your family life. I like to record our routine on either a digital calendar or spreadsheet programme such as Microsoft Excel. I like Google Calendar – this allows me to have a plan for each of my children and then combine each of those plans into a family chart for either day or week. 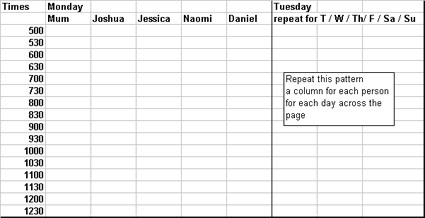 I can have reoccurring activities but then tweak or cancel them at a click of a button and reprint a new/fresh chart for each day. I can also print individual child’s activities – which my older children appreciate though it also helps keep my younger ones on track too. When they have their own chart for the day it begins the training process for them to be accountable for their own time. Though I use the clock to help me hang commitments on I have found that when I consider my day in blocks of time instead of small time slots I am a lot more relationship focused. Each block of time has its own to-do list. This helps me remember that I am a family not a school. My blocks of time have changed as my children have grown older. When I had babies in the house our blocks of time were built around meal times for some, and feeding times for the baby. When I had toddlers in the house our blocks of time were built around meal times and nap times. Now, with older children in the house, our blocks of time are still built around meal times though the rest of our day is based on discipleship needs. I keep in mind the areas of Relationships, Responsibilities, Gifts and talents and then Academic areas as I build my day. These are the “categories”, the areas in which I want to train my children; therefore I need to have time regularly to address these issues. This is ultimately what our routine is for – to give us focused time to address the things that are on our heart. Here is our core schedule for our study days. I offer this to you as a template which I encourage you to tweak to suit your family needs. The key is to see that a family can live life together, your heart can be for discipleship and yet still be responsible with your time. Wake-up, get dressed, exercise, devotions, breakfast, chores) Waking time is different for different members of the family. (the children are still working on areas of academics, talents, and responsibilities but it is more independent, often instigated from within themselves as opposed to my direction and teaching) It is during this time that I mainly work on other areas of responsibilities in my life. To-do lists also change regularly, depending on seasons of life, depending on priorities, depending on interruptions. To-do lists will also vary family to family. Establishing Routines gave consideration on how to find the priority things to start developing in your family life. This is worth revising as you consider the times of your day. Being Flexible, Having Choices helps us be prepared for the unexpected. What are you going to fill your day with?